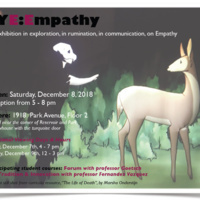 In this shared exhibition, FYE students in both Forum (with professor Goetsch), and Drawing: Tradition & Innovation (with professor Fernandez Vazquez) approach the subject of Empathy from differing perspectives within their artmaking. Participants actively gathered source materials for this challenge: "embarrassing" objects and "broken" objects, and/or old artworks deserving of another chance. By using "elevator speeches" to facilitate collaboration and interest, they ultimately generated acts of empathy for their found materials. Each artist has taken significant creative risks within their choices, thoughts, and actions in order to search for context, communication, and connectivity in their work. Context & Content, Visual Communication & Narrative, The Economy of Visual Language, Emotional Vampirism in Artists, Ethics in the Art World, Kintsugi (gold joinery), and Wabi Sabi, among other topics, such as Shame, Privilege, and the difference between having Sympathy and having Empathy. Located near the corner of Park and Reservoir, red rowhouse with turquoise door.